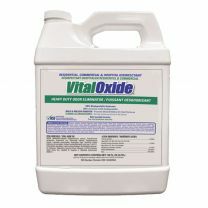 Vital Oxide is shipped Ready To Use (RTU) as a hospital Disinfectant and may also be diluted using our customizable blending & dispensing system with on-site mixing for multiple applications, including food contact surface sanitization, carpet sanitization, and heavy-duty odor control. NPD ships in RTU sizes and in dispenser-ready containers. Shelf Stable - over one year shelf life. Ready To Use - no activation step required. Space Saving Multi-Use - multi-dilution system. Saves Money - reduced spillage and waste. Save Time - employee time required to prepare solutions is greatly reduced. 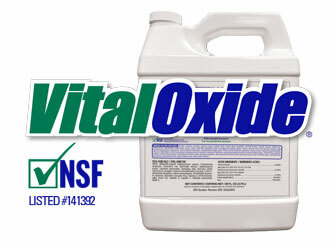 NSF Certified - no rinse required at any dilution. MRSA, Pseudomonas aeruginosa, Escherichia coli, Salmonella enterica, Staphylococcus aureus, Legionella pneumophila. Aspergillus niger, Norovirus(Feline Calicivirus as surrogate) Human Immunodeficiency virus type 1(HIV-1), Enterobacter aerogenes, Listeria monocytogenes, Acinetobacter baumannii, Rotavirus, Respiratory Syncytial Virus, Influenza A (H1N1)Swine Flu, Hepatitis B, Hepatitis C.
Hospitals, Cruise Ships, Nursing Homes, Restaurants, Hotels, Schools & Day Care, HVAC Systems, Sports Equipment, Building Materials, Drip Irrigation Lines, Kennels, Auto Detail Shops, Households, Attics, Crawl Spaces, Pest Control, Pest Removal more.